There are many instances in life where people’s preconceived notions get in the way of greater understanding. In the world of podiatry, an example is that some people think bunions are only caused by high-heeled shoes worn by women. If this were the case, there would not be instances of juvenile bunions. 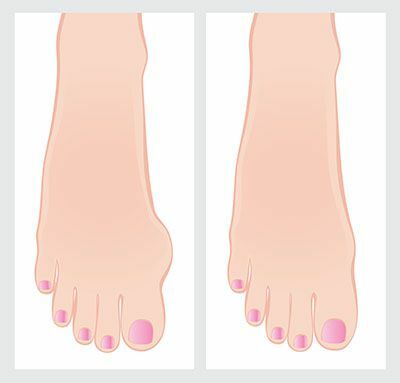 The truth of the matter is that bunions can develop in children’s feet, too. A bunion is a condition where the big toe begins to drift inwards towards the second toe, which results in a bony protrusion being formed at the base of the toe (where it meets the foot). The impacted joint—the metatarsophalangeal joint (MTPJ)—can then push out from the inner edge of your child’s foot, as the metatarsal bone starts to angle out in that direction. Unlike bunions that can develop in adult women’s feet, those in kids are not normally caused by footwear. Rather, this is usually an inherited condition passed along in your genes. There is also a correlation between bunions and flat feet in children, often attributed to the overpronation that occurs with every step. This faulty biomechanical process places excessive pressure on the big toe joint, which can then lead to this toe deformity. Orthotics – These custom prepared medical devices help with many foot and ankle conditions, including bunions. They can redistribute pressure in the foot, keeping excessive force off of the bunion, while also supporting the foot into a corrected position. Footwear Changes – If your child had previously been wearing shoes that had narrow toe boxes (the area in the front of the shoe), they need to be replaced with ones that have ample room so pressure is not being placed on the affected area. Night Splints – These devices are used to stretch the soft tissues and realign the bunion joint overnight. They apply a small amount of force and are easy to attach. Night splints have been proven to be quite effective in managing this condition. Exercise – Certain exercises can improve the joint’s mobility and strengthen the supporting muscles. If the conservative methods do not produce the desired results and your child is still in pain or has an impaired ability to perform normal tasks, we may need to consider surgery. Surgical procedures can allow us to repair the damaged joint and relieve pressure that causes pain and discomfort. We will generally not perform one of these procedures until your child’s bones have completely grown. At that point, we will explain the procedure fully so you completely understand what is entailed with surgery and recovery processes. Should your child be dealing with the pain and discomfort that can accommodate juvenile bunions, simply bring him or her in for an appointment and we will provide the effective treatment needed. Call our office at (972) 690-5374 or use our online form to contact us today.